Two optimist sailors, Jerdon Anderson and Jorge Olivarez from San Pedro, Ambergris Caye, visited Bacalar, Quintana Roo, Mexico, over the weekend to participate in the Regatta “Laguna de 7 Colores,” hosted by Associacion de Veleristas President, Miguel Ángel Pani. This was the first time that Optimist sailors from Belize have attended a regatta outside Belize. Anderson and Olivarez were 2 of 25 Optimist sailors racing, and after 6 grueling races over 2 days, Anderson captured first place and Olivarez took 3rd place. The two young sailors, who are known for their hardworking attitude, showed their skill and the level of performance now in Belize. 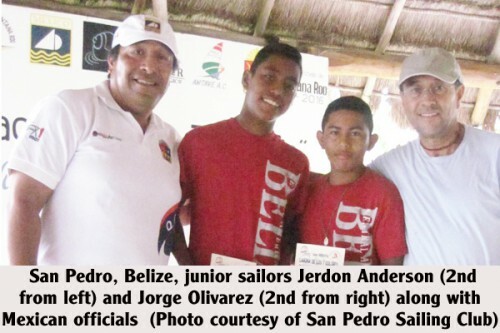 Bringing home these wins made the San Pedro Junior Sailing Club (SPJSC), San Pedranos and Belize proud. Many more adult sailors competed in the Laser and Windsurfing classes, and the young sailors have their eyes set on the adult categories for the future. It should be noted that Kevin Velasquez, also of SPJSC, took first place in the Corozal Bay Regatta, hosted by the Corozal Bay Sailing Club on October 12 and 13, 2013.